When I started assembling recipes for this month’s ‘Food Fast’ theme, I balked a little at including this one. Not because it isn’t fast (it is – the prep time and cooking time overlap, allowing you to get this on the table in 30 minutes), and certainly not because it isn’t good food. When I announced the theme, I said that all of the recipes would eschew advanced planning – this particular meal was made with my own home-canned tomato sauce, which would seem to violate that rule. But, I reasoned, you could simply buy a good pasta sauce while picking up the other ingredients and you’d be good to go. I stalled though, when I started trying to figure out just what ‘good pasta sauce’ really meant. I became hesitant because, frankly, it’s very easy to let a meal like this slide from thoughtful home-cooking into the territory of processed meal-assembly. To clarify, I should point out what I mean when I’m talking about home-cooking, as it goes well-beyond simply preparing a meal in the home. A lot has been said about the state of cooking and culinary education in the home over the last decade. Some are even beginning to wonder if the art is dead, or at the very least in a dire state. We eat out (or take out) more and more, and what we do make at home is often completely or partly pre-packaged. But one of the more insidious facets of this problem is the overabundance of processed foods designed to be assembled in order to approximate the idea of home cooking. I like to think of this as meal-assembly, rather than home-cooking. Pasta dishes like this one, which are so tempting and delicious and simple, can cross that line with frightening ease. These lines are difficult to draw of course, as any food that’s been altered from its raw, native state has been technically been processed. To say that I oppose the use of processed foods would be a lie, and this recipe is a perfect example of what I mean. Sausage, dried pasta, Italian seasoning, sugar, and cheese are all processed, in the most literal sense. Sugar, Italian seasoning, and dried pasta are what I like to think of as highly-transparent processed foods; generally speaking, you know exactly what you’re getting when you use them, and the ingredient lists require little-or-no culinary expertise to understand. But when it comes to sausage, tomato sauce, and even cheese, the waters get decidedly murky. Talk is cheap. Time for some data. In order to figure out just what kinds of changes you’d see when relying too heavily on more processed ingredients, I re-entered all of the nutritional information based on a modified version of the recipe. First of all, I removed the onions, garlic, and eggplant, and replaced the tomato sauce with a chunky-style onion and garlic tomato sauce made by one of the big-name brands. Good quality beef sausages are not always easy to find, so I chose a ubiquitous name-brand Italian pork sausage instead. the eggplant adds flavour, but it’s also filling. With it gone, I figured that most cooks would want to add a third sausage to the meal in order to keep the portions filling. This meant that the total amount of sausage went from 200 g to 300 g, or an increase of 25 g per serving. Every other component of the dish was left the same, including the pasta, olive oil, and added cheese (2.5 g per serving as a garnish). To help disentangle the variables a little bit, I also did a version with only two sausages, though I strongly believe that the diminished portion size would make most diners much more likely to go back for seconds. All of the changes make the experimental meal simpler; there’s less chopping, fewer items to purchase, and a more readily available protein. On the surface, it’s clear that there’s a little more meat in the new dish, and a few less vegetables, but the changes seem fairly innocuous. But when you break down the nutritional information, you start to see the slippery slope for what it is. Left to Right: My original version, the three-sausage/bottled sauce version, and the two-sausage/bottled sauce version. I want to make something perfectly clear right off the bat – my version is NOT a light, low-fat dish. It’s sausage and pasta, and it’s rich. The calorie count is fairly high, and there’s a good amount of fat and salt (two things that are virtually inescapable with sausage). Based purely on calorie count, you might conclude that I’m being overly fastidious. But when we look at the details, a different picture emerges. CALORIES – In terms of pure calorie count, the processed version with two sausages is lowest by a hair at 707 per serving. However, not unlike the ‘single serving’ on a bag of chips, this serving size is likely to be disappointingly small, given the omission of the vegetables and the extra filler sausage. Bear that in mind with the remaining notes as well. The 3-sausage processed version is, unsurprisingly, the highest in calories. FAT – The three-sausage version is, of course, higher in all types of fat (saturated fat is particularly high, reaching 50% of the RDI). No surprises there. But the ‘lighter’ two-sausage version is also quite high in fat, and this time it’s in disguise. Turns out that commercial pasta sauces frequently have a lot of added fat in the form of vegetable oil, and that’s what shows up here to the tune of an extra 8 grams of unsaturated fat. That’s not bad per se, and I’m not vilifying fat, but it becomes a problem when you’re adding it in without realizing it. SODIUM – Salt sneaks into processed foods in more places than you could ever imagine. In all three versions, I’ve allowed for 1.5 g of added salt (I personally don’t add that much, but I wanted to err on the high side). All of the sausages are high in salt and this is reflected in all three variations, making this category relatively even across the board. That being said, some commercial pasta sauces are much higher in salt than others. CARBOHYDRATES AND SUGARS – My version gets rung up for the higher numbers here, but the reasons are somewhat funny: my version has far more vegetables, and those (especially the onions) contain sugars. It’s easy to forget that, and it’s easy to put too much weight on these terms as a result. Added sugar wasn’t a major factor with the processed pasta sauce I selected for this experiment, but some sauces do are stunningly high in added sugar, often in the form of high-fructose corn syrup. All the more reason to label-watch. VITAMINS – Admittedly, this one blew me away, and it says a lot about relying on bottle of sauce to deliver your veggies. My version is respectably high in Vitamins A and C, and it has a decent amount of calcium given the the lack of dairy, legumes, and leafy greens. Iron is also a little higher in mine, but this is primarily due to the use of beef over pork. The two more highly processed variations are, to put it bluntly, nutrient-poor. The onions and eggplant bring a lot to the table, and a chunky ‘onion-garlic’ tomato sauce clearly doesn’t make up for them. Overall, the differences are not gigantic, but they are significant. It’s so easy to imagine cutting a few corners, and processed foods encourage that. A jar of bottled pasta sauce is selling you on the idea that the hard work is already done. Never mind the fact that making the sauce on your own isn’t that much work to begin with. I can’t tell you how many people I’ve spoken with who are reluctant to use eggplant, despite the fact that it’s basically foolproof in a dish like this. This is where fears about the state of home-cooking arise – processed shortcuts provide the illusion of simplicity while creating dependence. That dependence is contributing to epidemic levels of obesity, heart disease, and diabetes. The truth is, there is absolutely nothing difficult about this recipe. I would happily make it with a classroom full of grade 8 home economics students. But there are literally dozens of different types of pasta sauce lining grocery store shelves, and that says something very real and very urgent about both our perception of and comfort with home cooking. I for one think it’s time to do something about that. The notes above deal heavily with nutrition and ingredient selection, so I’ll try not to repeat myself here. Instead, I’ll just give a few basic notes about the ingredient and how best to use them. As I’ve explained above, the key here is simplicity. I make and can a very basic tomato sauce every year for recipes like this, and it’s just tomatoes, herbs, and a little lemon juice. If you can find a good but very basic store-bought sauce, use it. If you can’t, buy crushed tomatoes or whole canned plum tomatoes and use those to make your sauce. You may have to cook it a little longer in order to reduce it down and concentrate the flavours, and you might end up using a bit of extra seasoning, but it’s definitely worth doing. My local butcher shop makes a great in-house beef sausage, and I adore the flavour. The choice is not arbitrary – beef sausages have a bolder, more distinctive flavour in general, and I really like the way it works with the eggplant and the fennel. Fennel seed (or anise seed in some cases) is used as a common foil to pork in Italian sausage, and you could go that way here too if you like. If you’re looking to go leaner, a good turkey or chicken sausage could work too, but I’d encourage you to use one you already know and like, as the flavours will play very differently on each other. And if you’re into veggie sausage, I don’t see why you couldn’t go that route either. Go for it. Don’t fear eggplant. A lot of people are unfamiliar with it, but it’s easy to work with and easy to cook. I specify the use of long, thin Japanese eggplant here because it’s the easiest variety to work with. The skin is thin and generally doesn’t require peeling, and the flesh is rarely bitter. The large, oblong Italian eggplants are delicious, but they often need to be peeled, and some people like to salt and/or soak the flesh to draw out some of the bitterness. If you’re familiar and comfortable with cooking eggplant, use any type you like. If you’re new to it, I suggest starting with the Japanese variety. They can be found with increasing ease at the average grocery store. It’s a small ingredient, but I think the distinctive (but balance) flavour of fennel is one of the best things about this dish. You can use anise seed instead of fennel seed, but steer clear of the stronger and more medicinal flavour of star anise (which isn’t related to anise at all – it’s a confusingly named group). As a variation, you could also use a little bit of chopped fennel bulb in place of the spice, bringing more veggies and a bit more of that distinctive flavour to the dish. For the record, fennel and sausage together are actually quite common in Italian American cuisine, as is the Italian spice blend (which is more-or-less unheard of in the cooking of Italy itself). As Italian-American cuisine, this is a typical stand-alone meal. As an Italian dish with American influences, it’s ideal when served as one dish among many (preferably lighter) dishes and sides. There’s a detailed discussion of the nutritional profile of this dish above, so scroll up for more. GOOD NEWS:When made with the right ingredients, this is hearty, nutrient-dense, and very filling. It also avoids many of the high-salt/high-fat/high-sugar trappings common with more processed pasta dishes. BAD NEWS:This is a calorie-heavy meal, and fairly high in fat. That being said, 100 g of dried pasta is allowed for in one serving, and this can easily be reduced if this is served with a salad or vegetable side. Better yet, use this to serve six along with one or two other simple, healthy sides. Fill a cast iron or heavy-bottomed pan with water until the sausages are half-submerged, then heat over medium-high, turning the sausages occasionally, until the water has evaporated. Once the pan is dry, reduce the heat to low and brown the sausages in their own oil (you can poke them with a knife if they given up much fat). Remove the finished sausage rounds and set aside (if they're a tiny bit underdone, don't worry; you're going to cook them again). DO NOT clean the pan - you're going to use all that sausage flavour to cook the veggies. Bring a large pot of salted water to a boil. Add the bucatini and cook until al dente (usually around 11 minutes, but check the packaging for specific instructions). Drain and set aside, but reserve a little of the water from cooking the pasta. Once the sausage is cooked and set aside, add oil, garlic and onions to the hot pan and saute over medium heat for 2-3 minutes. Add eggplant, sliced sausage, and spices and cook for 10 minutes over medium heat, stirring occasionally. Add tomato sauce and cook until thick and reduced; about 10 more minutes. If the sauce starts to look too thick for your liking, or it's caramelizing a bit too fast, add a splash of the water from the pasta. 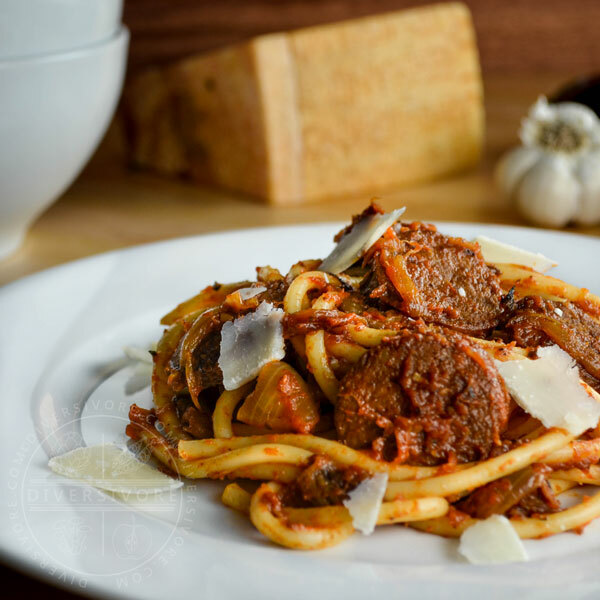 Toss the finished sauce with the bucatini and an extra glug of olive oil, and serve with parmigiano-reggiano cheese. Tomato sauce is a very broad category, and one that warrant further consideration. I strongly recommend that you do NOT use one of the jarred brand-name sauces with a distinctive name and a lot of herbs, sugar and salt added. These are intended to be used straight out of the bottle, and they vary wildly in terms of ingredients and nutritional profile. Instead, find a very simple, preferably unsalted (or very low salt) pure tomato sauce with only a few simple ingredients (tomatoes, possibly garlic/onion, and citric acid or lemon juice). If you can't find one that you like or that fits this profile, instead just use pure crushed tomatoes (ideally made from good Italian plum tomatoes). If you go this route, you may find that you want to add a little more seasoning to your sauce. Heck ya for ‘fast’ food that can be done on a budget! I love a good, hearty pasta dish and this one goes just a bit outside of normal with some fennel and eggplant. Heck ya indeed. I love to spend time in the kitchen, but it’s not always feasible. And it’s a lot better to have something quick, tasty, and homemade to fall back on than having to rely on processed meals or takeout. I’m glad you like the variations here too – I think it’s easy to fall into the ‘pasta trap’ and make the same things over and over again. It’s nice to switch it up a little. Fennel and sausage work so well together and I love the addition of eggplant tossed over pasta, delicious! They are certainly a classic, and I love how the eggplant really soaks up the flavours too. Thanks for your comment Marisa! Sometimes it’s nice just to have a big old bowl of pasta. If it’s sausage, done in 30 minutes or sat in a slow cooker for hours, pasta is a dish that a lot of people won’t fret over. Your version looks exactly like what I’d need after a long week on a cold Fall day. I’m so glad you posted it, even though you hesitated. Great post and photos Sean! Have a good weekend! I couldn’t agree more. I’ll happily admit to being a carb addict. I’m glad you enjoyed it so much Samantha! Cheers. I must say that as a self-taught, jump in the deep end kind of guy, your photographs always blow me away. Super crisp, they showcase exactly what the focus of your dishes are. Hopefully, I’ll be able to take pictures that great one-day:P…. What really blew me away here though, even as a professional chef, was the difference in vitamin levels in the dishes. I wasn’t overly surprised by the fat and salt contents( as you said sausage is salty, fatty and delicious because of it) but the fact that even the store bought pasta sauce had so much less “nutritional diversity” was surprising to me. The home-made sauce really is “healthier” and more nutritionally dense. This really serves as an eye opener, that it really is important, not just to “eat healthy” but to actually know where your food is coming from and what has gone into (or out of) it. Thank you Markus! Honestly, that means a lot to me. I’ve worked quite hard on my photography, and it’s always uniquely challenging but rewarding. Honestly though, I think a lot of it is just practice, research, and more practice. And more research. I was shocked by the vitamin levels too. I mean, vitamins are not the be-all-end-all of a dish, but I couldn’t believe how relatively nutrient poor the meal became thanks to the processed changes. And cheers to knowing what goes into your food – and to being the one who puts it all together! I love that you compare prepared (and heavily processed) foods with the homemade versions at a nutritional level! Very interesting. I would be curious to also look at the booming trend of artisanal products, and see if the “artisanal” variety (which really doesn’t mean anything anymore) has any added health benefits/taste qualities. With that point aside, a good pasta with sausage dish is always a hit at my house! I love the fennel with it too. Nice work, Sean! Thank you Hilary! I’m glad you like the recipe, and you certainly raise an excellent point. Artisanal, like ‘natural’ is one of those words that hasn’t really got an easily defined meaning, but is great for selling product. Sure, we all know what we WANT it to mean, but that’s not necessarily what’s being sold to us. I think you’d probably encounter some ugly nutritional realities if you looked at them in detail. I love your little experiment here, Sean — it was really interesting to read about! It’s important to remember that whole food, prepared well, always trumps processed ‘fast’ alternatives — and as you mention, you can definitely have it both ways. Good food, prepared from scratch, fast. 🙂 Every year, my Grandma cans tomatoes fresh from the Okanagan and gifts us with a case. I’m using them in my next recipe! Thanks Justine! In a sense, it’s a bit of a shame to see that some store-bought ingredients aren’t healthier. I mean, I know a lot of people lack the time, resources, or confidence to cook certain things from scratch. But when you really dissect something like this, I think it becomes clear that with what amounts to a very small additional effort, you get a much better result. I also think that this would be less expensive, at least in Canada – a lot of these bottled sauces are quite pricey, while the ingredients I’ve used here certainly aren’t. As for the confidence element, I hope more and more people will believe that they can in fact cook from scratch, and quickly to boot. You’re lucky to have your Grandma’s tomatoes to work with – you should ask her to help you can some yourself! It’s a wonderful skill to carry from one generation to the next. Cheers! It’s great to see the nutritional info comparisons for both dishes as I don’t think a lot of people realize just how unhealthy something like pre-packaged tomato sauce can be. Growing up in an Italian home we made our own sauce each summer and it’s not only healthier but the taste and pulpy texture are totally different from store-bought. I like that this hearty meal can be made so quickly; ideal for winter weeknights! I love homemade tomato sauce too, and I love making my own (or at least I do ever since I bought a food mill). I hope this convinces someone somewhere to ditch the jarred stuff and to try making a simple sauce with fresh, crushed, or canned tomatoes (and a mess of veggies of course). After all, as you say, you can make something like this on a chilly weeknight and see firsthand just how fast and easy it can be!